Expedia is a leading online internet based website, it’s one of the most popular traveling website. Expedia users can book air tickets, rent cars, hotel reservations, vacation packages and many more. This clone script offers travelers the ability to select and book a wide selection of accommodation for hotels, flights and tourist attractions across the world. The Expedia clone script has a potential platform which provides an easy, fun and efficient way to plan the perfect trip to travel across the globe. Our Agoda clone script is provided with services to book airline tickets, provide car rentals, hotel reservations, cruises, vacation packages and various other attractions and services via website and telephone travel agents. There are several ways to attract more customers, but the Expedia clone scripts make the process much simpler. Expedia Clone is a part of Travel Script and it has a very nice user interface so it can be handy and user-friendly. Our Expedia script has the potential to become a platform and provide an easy to use and fun site; it is the most efficient way to plan and book the perfect trip for travelers across the world. There are many features available for making your online booking system flexible which is smart search option, social login, multi-lingual, responsive design and many more. Customers are able to check available inventory and complete a booking online making the reservation process more efficient and less time consuming to both parties. This reservation & booking script reduces time spent on managing inventory and responding to inquiries that do not result in sales. With our Expedia clone website you can offer travel agents a wide selection of hotels, tours, and transit rental products at their commissionable rate on a single checkout. The admin can manage comments and post rules but it is possible for the users to leave their comments, ratings by giving stars and share their experience with others. The admin can create individual email notifications for users and registrants; it is possible to customize your email messages through admin using a set of available gestures. Through admin panel, travel agencies can manage inquiries and reservation of the travel script. Rental platform has many features like booking a list, detailed listing page, favorite listing, membership fee, Google map integration, bulk email option, wallet, social sharing, multi-currency support, mobile & SEO-friendly etc., and vacation rental script has different management systems like listing management, user management, coupons management, static page management, etc., hotels Booking System allows you to create different room types, automatically calculate the total price, prevent duplicate bookings, handle bookings and prices, and accepts payments online. It is easier and possible to build an online booking system by offering different services like flight, cruise, car, bike and many more. We know that getting your website to the users is necessary which is why we have made our script to be SEO-friendly by optimizing it in accordance Google standards. We also provide 1 year of technical support, free updates for the source code for 6 months. We will provide you with the full source code upon purchase of the script and your website will go live within the next 24 hours. Very fast and professional customer support. 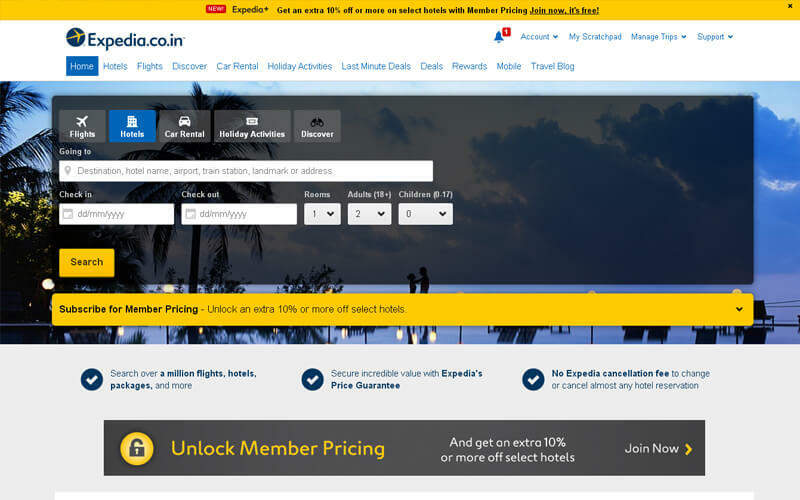 Expedia clone has all basic feature of original site really good to see this in clone. Guys you rock it! !